Posted October 15, 2015 . Over 1000 attendees at the Trends in Medical Mycology (TIMM) meeting in Lisbon from 63 countries, heard how many serious fungal infections there are estimated to be in Mozambique, Madagascar, Pakistan, Algeria, Venezuela, Serbia, Greece, Portugal and France. Around 390 million people live in these countries and the fungal problems seen in each. vary substantially. Tinea capitis is a big problem in sub-saharan Africa, along with complications of AIDS. In Venezuela, disseminated histoplasmosis, Pneumocystis pneumonia and Candida parapsilosis in bloodstream infections are most problematic. 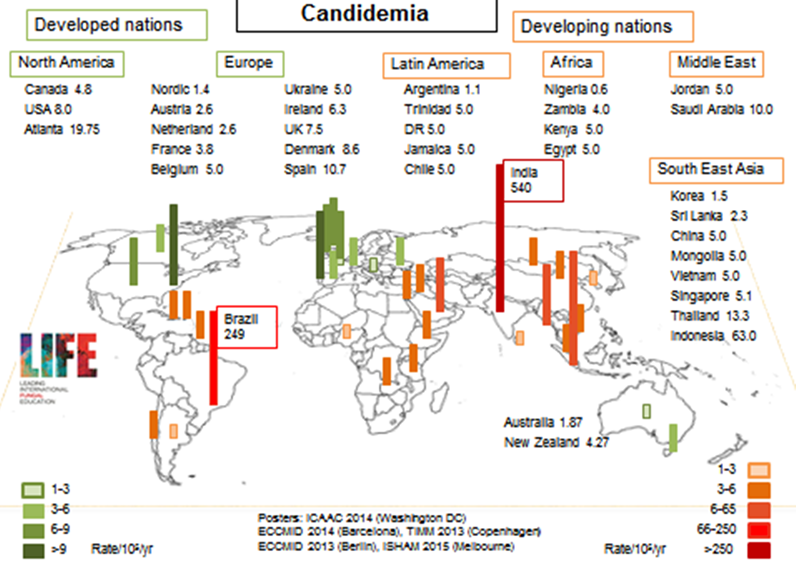 In both Pakistan and Venezuela, the population rate of candidaemia was very high at 21 and 16 per 100,000 respectively. In Greece and France, fungal asthma (ABPA and SAFS) are particularly problematic. In Madagascar, chromoblastomycosis is a particular problem, with an extraordinarily high rate of 14/100,000. These estimates bring to 5 billion (71% of the global population), the population rates of serious fungal disease done by the LIFE program over the last 3 years. These and other data are summarized by Professor Arunaloke Chakrabarti in his TIMM talk: “Burden of invasive fungal infections in developing countries”. View talk. Papers describing these estimates are available for 20 countries here. Algeria, France, Greece, Madagascar, Mozambique, Pakistan, Portugal, Serbia and Venezuela.